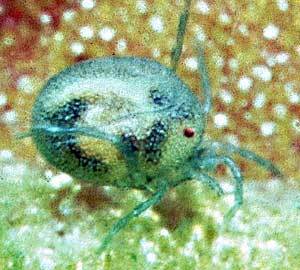 Arrenurus globator is a very common watermite in the Netherlands. The male of this species has a tail and, like most Arrenunrus species, it is smaller than the female. 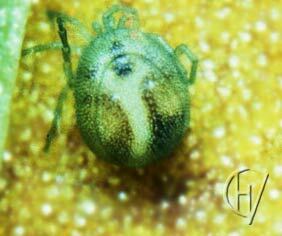 Arrenurus watermites have a tough armour and feel like a grain between your fingers. The dorsal and the ventral shield are fused together in a groove, which is visible on the back. 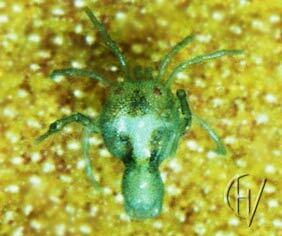 In many references the Arrenurus genus is divided into four subsgenera on basis of the shape of the male's body. Species with a tail are then grouped in the subgenus Megaluracarus (Besseling,1964). That name seems difficult, but is quite obvious: Mega‑: big, ‑ura‑: tail, ‑acarus: mite. LINK: Fantastic stacked picture of an Arrenurus species (male) by Charles Krebs.